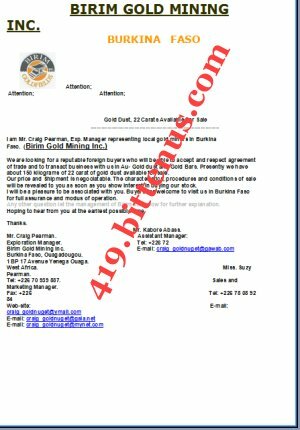 and respect agreement of trade and to transact business with us in Au- Gold dust and Gold Bars., presently we have about 150 kilograms of 22 carat of gold dust available for sale. Our price and Shipment is negociatable.The charactaristics, procedures and conditions of sale will be revealed to you as soon as you show interest in buying our stock. I will be a pleasure to be associated with you. Buyers are welcome to visit us in Burkina Faso for full assurance and modus of operation. 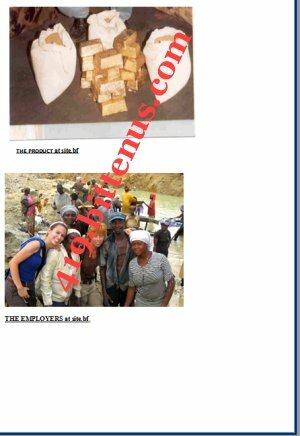 Any other quetion let the managment of Birim Inc. know for further explanation. hoping to hear from you at the earliest possible time. West Africa. Miss. Suzy Pearman. Tel: +226 70 939 887. Sales and Marketing Manager.